Looks like you attached the wrong graph. You meant to attach the one where gains attributable to "labor unions or minimum-wage laws" outpace gains due to "rising productivity." But instead you attached the graph where median income and productivity both go up at the same time, each in a relatively linear fashion. "The iPhone sales and the Blackberry sales both go up at the same time, each in a relatively linear fashion." "Cancer survival rates and smallpox survival rates both grew at the same time, each in a relatively linear fashion." "The fighter jet and the tortoise both accelerated at the same time, each in a relatively linear fashion." Also, although admittedly "relative," you have a funny idea of linear. I think my graph says a little more than your description of my graph admits. Namely, that there are important things affecting income growth outside of productivity gains -- something you'd never guess from reading the textbook's description. So this would be the tortoise that raced a fighter jet, but lost because he topped out at just under twice the speed of sound? What? Were you expecting the growth in median family income to magically track the growth in productivity? And I totally stand by my characterization of the median family income as relatively linear, but I guess I should have been clearer that exactly what I was saying that this ( ╱ ), and not ( /¯ ), is what the graph looks like. By "relatively" I mean that it isn't smooth. It is generally going up, but experiences identifiably flat and down points, e.g. in the early '80s, in the early '90s, in the later '00s (I wonder what was happening to the economy in those periods?). Oh, you could try to draw an inflection point at 1970 or so, and then once you calculate an average slope for the period that shows the cyclical pattern, it is less positive than the sustained slope in the '50s and '60s (and I'm sure if you extended that graph back another two decades it would continue to show that same very positive slope). 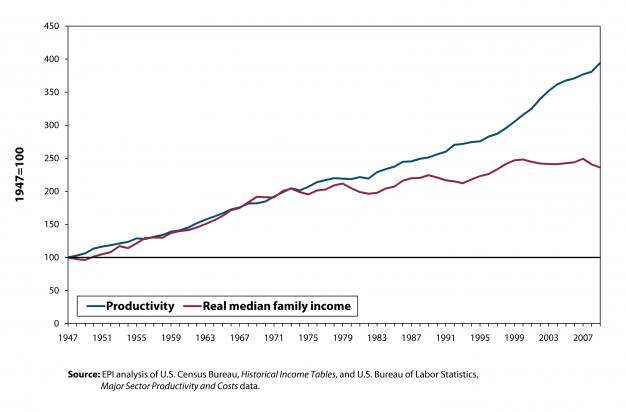 But if we are going to draw an inflection point in the '70s, we do need to ask if anything happened then that would be consistent with the story that gains in productivity translate into gains in worker income, but which would make median family income and productivity diverge. Perhaps something that would allow for an increase in the size, and therefore specialization, of the work force, and simultaneously lead to a change in the composition of the median household. I can't think of anything, but hold on, I'll go over to my kitchen and check with the barefoot person there who has a bulging uterus. Hmm. Still got nothing. 1) Assume that for each worker in a nation, changes in that worker's productivity have a fixed proportional relationship with that worker's income. Holding all else equal, assume that the productivity of the top 30% of workers by income increases at a faster rate than the productivity of the remaining 70%. Imagine that you were to plot GDP, average income, median income, and national productivity on a graph, each as a percentage of their amount in an initial year. What will be the relationship between each of the resultant lines? 2) Do not hold the relationship between productivity and wages constant. Assume each of the following things happen, which increase productivity of the affected workers: a) increased economic specialization through trade, b) capital investment in a factory, c) capital investment in all parts of an industry, d) increased matriculation in higher education, e) increased quality of primary and secondary education, f) innovations in national infrastructure. Holding all else equal, in each case, what will be the varying factor that determines what portion of the productivity gain is translated into wage increases? Between each five, which will generate the greatest gains for workers and which will generate the smallest gains? Explain why.